Need to rebuild the stone ring and add some soil. Pretty sure I have enough stones to add another ring on top. Difficulty here is that there is a HUGE boulder maybe 4" to 6" under the surface about dead center for 4 to 6 square feet and it tapers off from there. So, the middle have has very little soil depth. Re: What would you do with this? Why fight it? -- what about putting a pre-formed or liner lined shallow pond for the boulder to support? I mean I like the birdbath it's lovely, but a pond would be bigger, and depending on how you design it, less formal. While you are at it, you could add some kind dry stream bed maybe or of waterfall or just a oozing spring if you have electrical access or you might just get something solar or wind generated. I'm playing with ideas to adapt air pump water lift concept for my pond's moving water feature. I envy your ready supply of rocks. I have to go buy or scrounge them so my rock projects go very slowly. My 2nd concept idea would be a rock garden. Why bury the boulder? It would provide thermal mass and condensation drip watering for the surrounding area. Have both rock and stones here. Come gather as many as you like; just bring a shovel and it doesn't matter where you dig, nor how deep. Search youtube for air lift pumps and geyser pumps, both are used with aquariums. I have a hybrid for my little 2.5 gallon betta tank. The double valve set up can move a lot of water on not so much air if you deal deal with the surginess of it. There is very little to less depth out there and it drains super fast. The boulder is a huge rounded chunk of granite, at minimum, shed sized if not bigger. Posted this looking of ideas of what to plant in there. (Before the stone ring and initial fill, flocks and a hard time staying alive.) Have about a yard of compost ready to go and more than enough sandy gravel to mix 50/50 to refill it with. Sort of want to get rid of the hostas and the indigo/purple siberian iris aren't doing as well as I thought they would. Have to rip it apart to rebuild the stone ring and refill it, so I was looking for outside ideas of what to plant in there. how sunny is the area? 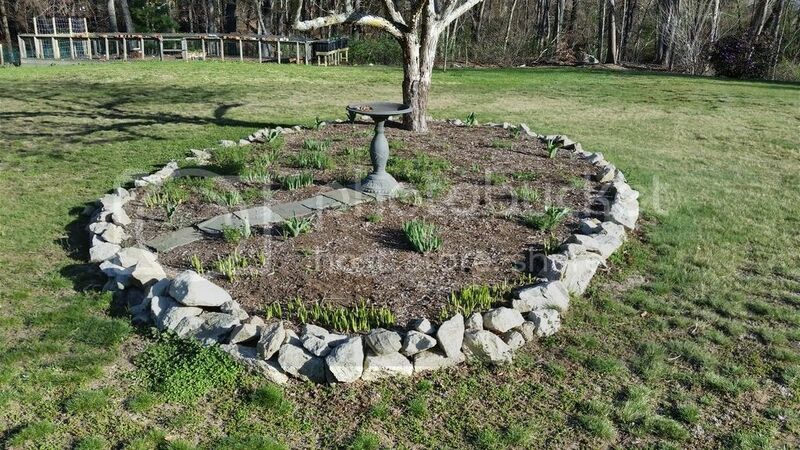 If you raise the outer ring of stones and fill in the middle it will add depth. As long as the soil can drain and you don't plant anything deep rooted over the boulder it should be fine. The birdbath does look lonely there and it is small especially when there is no context for it. You could actually make it a "natural" area to invite beneficial insects in. Add more stacked rocks, and a log (hollow or a log drilled with small holes for nesting). Some native plants; nectar and pollen flowers; vegetables and herbs. Put in a few flowering shrubs for shade and cover for the insects. Leave some bare ground for ground nesting bees. 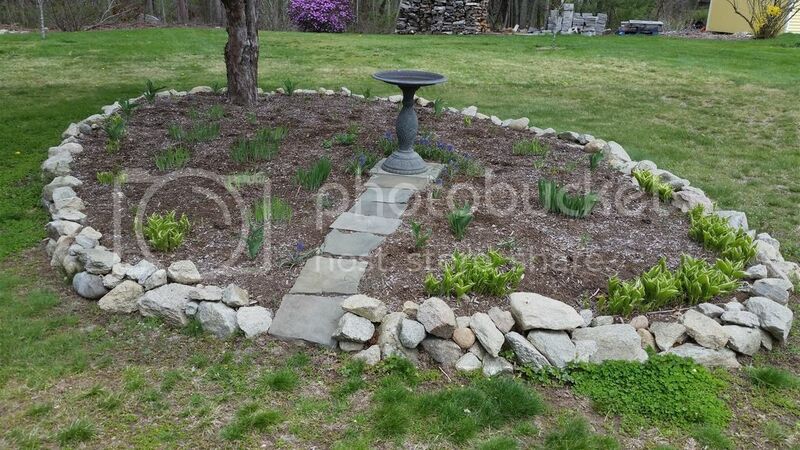 Add a few stones to the birdbath to provide landing places for the butterflies and bees to take a drink. The tree in the back might be a good place for some artificial hives and a hummingbird feeder in the off season. Plant a suitable winter cover crop. The whole thing get full sunlight about 80% of the day. With that ornamental tree, the ground sees a mix of partial shade / filtered sun with direct sunlight early and late in the day. Drainage... Have more than enough of that, especially with how dry the local area is during the summer. You can leave a garden hose on the ground and it will barely form a puddle. No one can keep a lawn alive around here without irrigation and that only works till the water ban get enacted sometime mid summer. Patio/sitting area, Firepit over the rock? Veggies... Build up the sides with 6x6's for a raised bed (keyhole)? Veggies... Build up the sides with more stone for a raised bed (keyhole)? You could also choose drought tolerant *native* plants that would also provide birdseed... maybe coreopsis, New England aster, etc. First get the weeds out, then plant some radish, turnips and lettuce seeds. If you don't want to grow some food, toss the rocks in the garbage bin and level it up and plant Kentucky Bluegrass. Then you can just run the lawnmower over it once a week. I wish 5 gallons of diesel and a road flare could be used. There is no leveling with out dynamite. It will be a garden at least a few more years and nature have mercy on anyone moving that bird bath. Still looking pretty sad. Still very undecided what to do other than get more soil in there and restack the stones more neatly. OK -- one more go -- what did you say the tree was? If the birdbath is a fixture, I would definitely turn this into a bird/butterfly garden. A plant grouping with different heights and flowers and fruits/seeds for different seasons that will be attractive to birds and butterflies. I want to see wild strawberries (F. virginiana or alpine) as groundcover, low-growing berry shrubs like blueberries or honeyberries, currants, viburnums, shrub cherries, juneberries ... hummingbird fave flowers if you get hummingbirds there -- heuchera, salvia, beebalm ... butterfly faves like asters, sedum, trying to think of flowers that aren't too tall... maybe purple coneflower... trying to stay native --avoiding saying zinnia haha... seed-bearing flowers like the tickseed, coneflowers, evening primroses, etc. I don't know the answer to your question. Only you do. But it seems to me that your are trying to do something meaningful here – spiritual, if you will – using that term in a vague sort of way. I mean the circle you have there is something other than a scientific way to grow vegetables. The only suggestion I would make it to think of the stone not as an obstacle, but as something that belongs there, something that should be accepted and worked with. If you let yourself explore more about what you are trying to do with that circle, and what the meaning of the stone is in it, maybe more ideas will come to you. The tree is some kind of ornamental fake apple tree or something ... lots of red blossoms right now. roots are shallow and spread all over the place. The reason the garden is there at all is mostly about protecting the lawn mower blades and quelling the dust patch over the rock. Left to my own devices, I would be explaining the misuse of fertilizer and diesel fuel. I learned a neat trick on my uncles farm in northern VT when I was sent "on vacation" as a kid. Spent a good part of a summer making pasture / removing trees, big rocks, big stones and big stumps. That method is sort of frowned upon these days though. I guess what I am looking for is suggestions on low maintenance annuals to put it there that can deal with DRY. Stuff that I can plant in there in a predictable pattern so they will be easy to mulch around, have blooms most of the season. Basically, plant it; mulch it, forget it, clean it up in the fall and re-mulch it in the spring. Planting natives will be the lowest maintenance since the plants should be adapted to the area. They will need to be watered until they are established, but if they get a good head start, they should be able to survive on minimal extra water after that. Thanks for the list of plants. For some reason I am thinking the wild flower thing would be more work and time than just sticking with the hostas, crocuses, tulips, siberian iris and grape hyacinths. I know that stuff will survive there and be comfy enough under bark mulch. Should probably add in a few short version of whatever those daisy- like annuals are and call it good.